1901 brought the Pan American Exposition to Buffalo, NY. The Expo was a World's Fair, but this one was focused on the Americas. 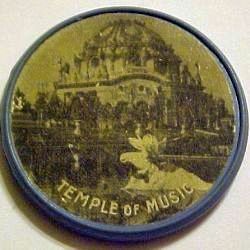 The Pan Am Expo is of particular interest as there were a large number of souvenirs sold. One of the most popular, due no doubt to the low price, was encased coins. It is currently thought that the encased cent made its debut there. 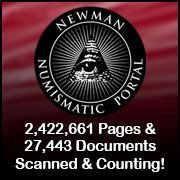 With the availability of inexpensive aluminum for the encasement the encased cent was a born. Below is an example of one type. The vulcanite encased from the Pan Am Expo are just a little different. The encasement is not aluminum but "vulcanite". What is vulcanite? It is a rubber compound also called "ebonite". The ebonite nomenclature comes from it being a substitute for ebony. It is made from vulcanized rubber that is 25-80% sulfur and linseed oil1. It is inexpensive and easily formed into a variety of shapes. 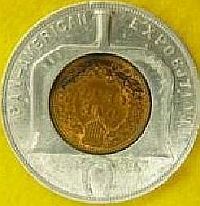 For the souvenirs from the Pan Am Expo it was formed into a disc shape with a raised edge. The disc was approximately 38 mm in diameter and the raised edge was on both sides. 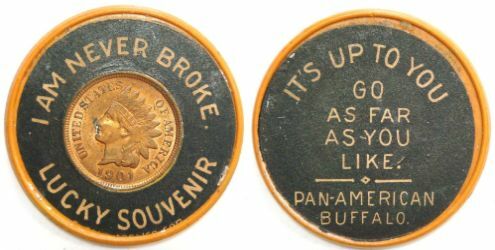 As you can see from the example below, one side held a picture of one of the main attractions of the expo and the other had the Indian cent with a ring around it with "I AM NEVER BROKE /LUCKY SOUVENIR" and the smaller text "Patent Applied For". The picture on the one side was an image printed on a paper sticker and glued to the vulcanite. (NY)-(BUF)-PX-80. 1901, RD,38mm, vulcanite, holed in middle for cent to sit in, about twice as thick as the aluminum. 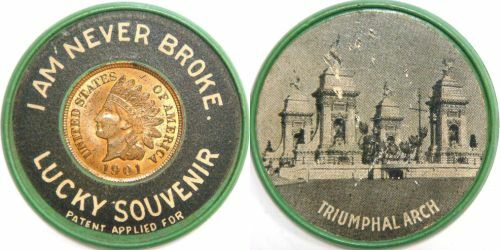 I Am Never Broke// Lucky Souvenir / Patent Applied for\\ [thin paper sticker on back -- picture of the Triumphal Arch]// Triumphal Arch. This has a blue edge and border, grey black background and yellow lettering. Another sample has a white edge and border. JL, PAECS (with the white border), all the -80 series should run $100 or so. (NY)-(BUF)-PX-81. Same as -80 except has orange border and Temple of Music on rev. (NY)-(BUF)-PX-82. Another example with an orange border and the Government Bldg. (NY)-(BUF)-PX-84. Dark green, with words on the rev. : Where Does Grass Grow?/ In Mexico/ Your Buffalo/ "Put Me Off"/ Pan American/ Expo. (NY)-(BUF)-PX-85. Red with words on the rev. : You've Got to Show Me/ I'M/ From/ Missouri/ [line across]/ Pan-American/ Buffalo. (NY)-(BUF)-PX-86. Oh Fudge/ "Forget It"/ Perhaps Taint True/ "Put Me Off/ At/ Buffalo". Obverse: "I AM NEVER BROKE. / LUCKY SOUVENIR / PATENT APPPLIED FOR" IN TAN LETTERS AGAINST A BLACK BACKGROUND. As you can see, Jim lists 7 different Pan Am vulcanite types as does Frederick. Neither one lists the "IT'S UP TO YOU / GO AS FAR AS YOU LIKE / PAN-AMERICAN / BUFFALO". Both lists are identical in listing seven the same (7) slogans and/or images. Lavin in his book lists several colors for each piece, while Jim lists only one color. It is safe to say that there at least eight (8) different vulcanite encased from the Pan-Am Expo of 1901 without taking into account color varieties for each image or saying. Pictured below are the "Temple of Music" - "It's Up To You Go as Far as You Like" / Night View of the Tower - You've Got to Show Me I am From Missouri / Government Building - Triumphal Arch . I have not seen the PX-86/EC37. I do not have PX84/EC31 (Where does grass grow) or PX86/EC37 (Oh Fudge/ Forget It) and would like to add an image of these pieces to the website, so if you have themplease send me an image and I will post it and attribute it to you.